Jiffy Self Storage is helping to raise money for flood victims in Pakistan. According to the United Nations, the floods that began in late July have created “one of the largest humanitarian crises that the UN and its humanitarian partners have ever responded to.” According to the UN more than 200,000 houses have been demolished and in excess of 4.3 million persons are affected. To put it into another perspective, a flood of this magnitude would affect about 12% of the Canadian population or would be close to the entire population of Toronto GTA. 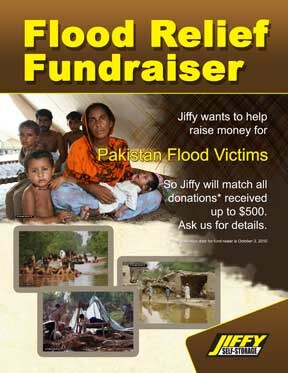 Jiffy Toronto matches private donations for Pakistan flood victims. We are disappointed that the response from Canadians was not forthcoming in the same magnitude that resulted in many Canadians donating money for the earthquake victims in Haiti. Perhaps, if this major catastrophe had happened first, there might have been more support. I suppose that we will never understand the reasons for less support from Canadians. While we acknowledge that there is and continues to be a need for support in Haiti, there is still much that can be done by Canadians for relief of the flood victims in Pakistan. The Canadian government has announced an extension of the matching of donations until October 3 and Jiffy Self Storage pledges to match donations that will be made at the Jiffy Self Storage office up to $500. If we can collect $500, we can leverage this donation to $2,000. Please give with open hearts for a cause that is essential for saving lives and preventing diseases and untold suffering.